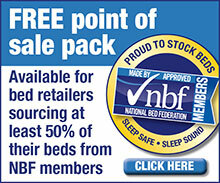 Floorcoverings and beds chain United Carpets is considering introducing a new beds brand under the Good Night label. Law firm DWF has — on behalf of the Rotherham headquartered retailer — applied to UK intellectual property authorities to trademark the logo (right) for bedroom furniture products. The application doesn’t include Class 35, which takes in retail services, suggesting its use will be for merchandise rather than a new store fascia. United Carpets trades largely through franchised stores and already carries an extensive value driven collection of divans, mattresses and bed frames. It has close to 60 UK stores and network sales — including franchisees — of around £56m.